Smoothie Bowl (Banana Free) & Why Make Sugar Free Smoothies? The question of whether or not to eat sugar comes up a lot for many of our clients, especially when it comes to cancer prevention. This can be a challenge when it comes to making smoothies and clients ask us if it’s okay to put sweet fruit in them. In honour of Breast Cancer Awareness Month, this October, we are going to be sharing some blog posts with important information for women…and the question about sugar is one of the things we’ll look at. If you don’t like bananas it can be tough to find a good smoothie. We admit it, even we resort to using bananas as a key ingredients in smoothies most of the time. But, we don’t all love bananas and we get bored of their strong, overpowering flavour that seems to take over the entire smoothie no matter what other delicious ingredients we add. Besides the flavour, there are a lot of reasons why many of our clients limit or avoid their intake of bananas. It’s not that they aren’t healthy, in fact bananas are actually technically a low glycemic fruit. On the Glycemic Index scale they are rated at 51, and foods below 55 are considered low glycemic (meaning, they won’t release carbohydrates rapidly and spike your blood sugar as quickly as high glycemic foods immediately after eating). Bananas are also infamously known for their high potassium content, which is an important mineral needed for electrolyte balance. So, why would you stop eating bananas? Bananas are still sweet and contain sugar, just as all fruit does. However, if you are managing or recovering from a health issue, limiting sugar intake is helpful for many reasons. Whether you are dealing with blood sugar management, hormonal imbalance, digestive imbalance, or cancer, reducing your sugar intake supports the balance of good bacteria in your digestive tract. Too many sweet foods fuel overgrowth of bad bacteria and yeast in the gut. This in turn not only interferes with proper digestion and removal of waste, but can weaken the immune system. 70% of your immune system is found in the lining of the intestinal tract. When the good bacteria is out of balance here, your body’s first line of defence is weakened. If you are dealing with insulin resistance or want to prevent that from happening, it’s a good idea to limit your intake of sweet foods (especially refined carbs like sugar, white flour, and processed foods). These foods trigger your pancreas to release insulin to help shuttle the carbohydrates into your cells. However, if lots of sweets and simple carbohydrates are consumed the pancreas becomes taxed with producing so much insulin. And, your body’s cells can eventually stop responding to insulin (insulin resistance), which leaves glucose circulating in the blood stream. This elevated blood sugar and insulin resistance is linked with inflammation, which increases cancer risk. This doesn’t mean you have to stop eating fruit or whole grains and starchy vegetables. Sweet potatoes and other root veggies, brown rice, quinoa and other whole grains, and so many fruits are packed with essential vitamins, minerals and other nutrients. It just means that you want to eat these things as part of a balanced diet with lots of leafy greens, a rainbow of colourful veggies, clean proteins (beans, legumes, nuts, seeds, eggs, or organic animal protein if you’re omnivore), and healthy fats like extra virgin olive oil and omega-3 rich flax oil. And, limit your intake of sweet foods and avoid refined products like white flour and sugar. So, whether you are limiting your intake of sugar or just don’t like the taste of bananas, here’s what you can use instead to make a smoothie. Pears are a bit lower on the glycemic index than bananas and taste less sweet. Add pear into your smoothies instead of bananas. You can replace banana with the same amount of pear for a similar consistency. If you’re going completely sugar free, then avocado will provide the perfect creamy texture to your smoothie that banana normally does. But, then you might be dealing with a smoothie that’s not sweet enough. Berries are your best friend here. They are low glycemic and the lowest sugar fruits. If you still need more sweet taste, then we recommend adding a few drops of stevia to the avocado based smoothie. Many healthy vegan protein powders are already sweetened with stevia, so if you add a scoop of that into the smoothie it can provide some sweetness. Place the pear, blueberries, and hempseeds (or protein powder) in the blender. Break the acai smoothie pack into a few smaller pieces and add to the blender. Add a little bit of the milk and blend everything together. Add the milk gradually, as needed to get everything blending. 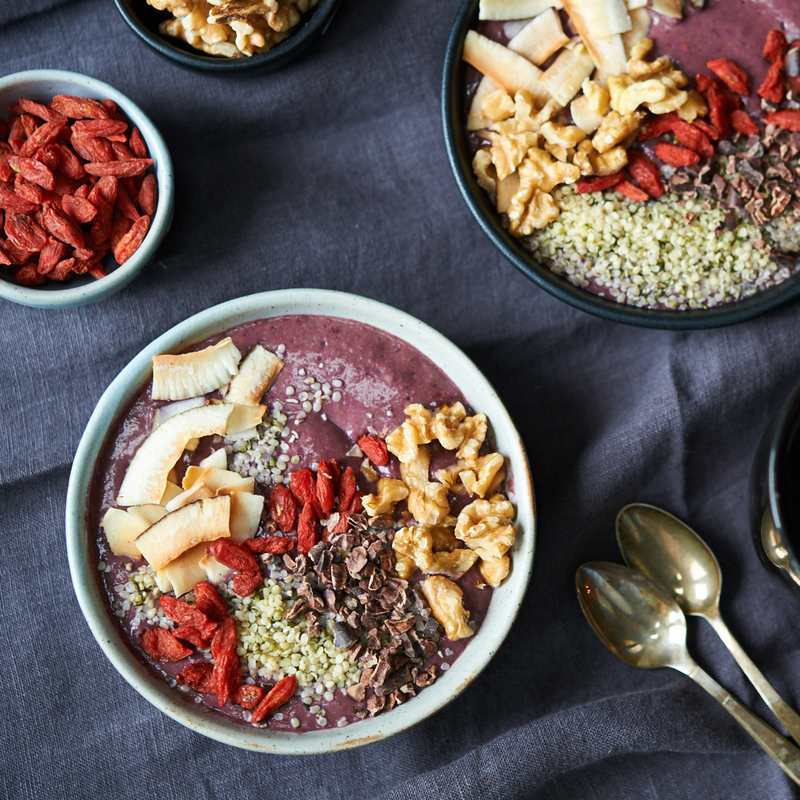 The smoothie bowl with be thicker with less liquid added. Once everything is creamy and smooth pour into a bowl. Top with your toppings of choice! Ben-Shmuel S, et.al. “Metabolic Syndrome, Type 2 Diabetes, and Cancer: Epidemiology and Potential Mechanisms.” Handbook of Experimental Pharmacology, April, 2015. Sears, Barry, and Mary Perry. “The Role of Fatty Acids in Insulin Resistance.” Lipids in Health and Disease 14 (2015): 121. Simopoulos, Artemis P. “An Increase in the Omega-6/Omega-3 Fatty Acid Ratio Increases the Risk for Obesity.” Nutrients 8.3 (2016): 128. PMC. Web. 27 Sept. 2017. Wellen, Kathryn E., and Gökhan S. Hotamisligil. “Inflammation, Stress, and Diabetes.” Journal of Clinical Investigation 115.5 (2005): 1111–1119. PMC. Web. 27 Sept. 2017.